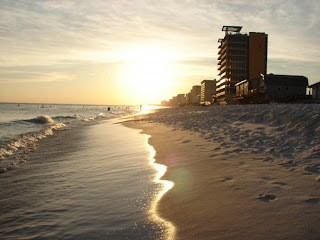 I just returned from our yearly family vacation to Panama City Beach. We started going about 15 years ago in mid to late July as a part of Trey's birthday present. Over the years we have met a great group of people who go the same week and stay in the same place as we do. We have gradually become friends with them and look forward to seeing them every year. The group has steadily grown, and this year there were close to 50 people there! Of course it's impossible for that many people to do everything together, but there are certain things that most everyone does. This year we grilled and had a huge steak dinner one night (45+ steaks cooked for adults with hot dogs for the kids) followed by a birthday party beside the pool that continued later that night on the beach. We also took pontoon boats out for a five hour ocean ride one afternoon where we picked up sand dollars, watched dolphins swimming, and visited Shell Island. There were five boats rented with almost 50 people on board! I wouldn't want to give up this trip and miss seeing everyone for anything. But unfortunately even after three years, it continues to be a difficult week for me. I thoroughly enjoy the things we do together, but each year I miss Eddie and regret that he isn't there with us. At the end of each trip I feel like I've been on an emotional roller coaster for the entire week - happy and up one minute, sad and down the next. I always remember how much Eddie enjoyed these trips, but I'm constantly reminded that I'm no longer enjoying the trips as a part of a couple. I still look for him sitting beside the pool or throwing a football on the beach. This year when we took the pontoon boats out I had two specific times when I thought for a second that Eddie was there - once I actually turned to ask him if he saw the dolphins and once I could have sworn that I saw him standing on the beach at Shell Island. I realized on this trip that the bitterness I've been feeling lately and the fact that I haven't forgiven Eddie 100% is related more to what he took away from Trey than to what he took away from me. This year I watched Trey go deep sea fishing and play horse shoes on the beach with someone else Eddie's age. I also watched that same person playing with Emily, and I couldn't help but think how it should have been Trey's father and Emily's Papi doing those things with them. After watching these, I took a long walk on the beach one morning by myself to do a lot of thinking. It was then that I realized my bitterness and anger are more over what Trey lost than what I lost. I know we will continue this yearly trip because it has become a tradition that we don't want to give up. What I don't know is how much longer these memories and feelings of loss will continue to make the trip with me. I know I'll never forget the times Eddie was there as a part of our fun, but I would like to return from my vacation feeling rested and relaxed instead of feeling like I've spent the entire week on a roller coaster.